As much as I adore the likes of Arvo Pärt and John Tavener, it mystifies me to see their names being repeatedly opened like comparative umbrellas under which other contemporary composers are ushered from the critical storm. Enter Giya Kancheli, who has carved such a lasting gouge in the recorded landscape that one could hardly mistake it for that of anyone else. Though he may share the same light as his contemporaries, the Soviet Georgia-born composer gives off an entirely unique reflection, and would seem to hold no illusions regarding the messages of his music. The massive orchestral works on this disc are like two mirrors held in front of one another, projecting endless sorrow into a trembling corridor. From the opening measures of…à la Duduki (1995), we are graced by a sound that is at once anthemic and solemn. The intermittent brass proclamation invokes nothing more than itself. Although the music harbors a potential for regularity, it prefers to express its wordless sentiments with widely varying degrees of fluidity. Ultimately, gentle hearts still these moments of profound drama. The occasional piano introduces a human color to the palette, which otherwise seems to paint an atmospheric veneer far beyond our touch. The music falls as it rises: that is, in anticipatory silence. 1994’s Trauerfarbenes Land (“Land that Wears Mourning”) introduces another resounding breach of sound, only this time accentuated by a more pointed percussion section. For the next 37 minutes, we are subjected to a slow vacillation between agitation and peace, self-hatred and prayer. The power of this music is the power to unsettle, guiding us away from our comfort zones into a land that, like its title, is indeed cloaked in grief. Yet what appears on the surface a poignant meditation on the harms of the material and the abstract ends up the product of a beating heart and nothing more. Every moment of delicacy pulls those gravid statements closer and every bellowing cry brings that crawling darkness into blinding light. There is no tragedy to be found here, but only the nooks in which we hide our fears. 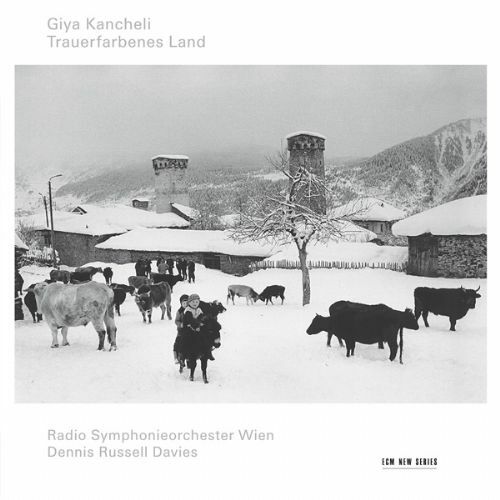 As with any Kancheli recording, one will find familiar footholds, and will thus feel supremely grounded in these musical surroundings. At the same time, there is an underlying (in)difference, an umbral presence creeping in from all sides. 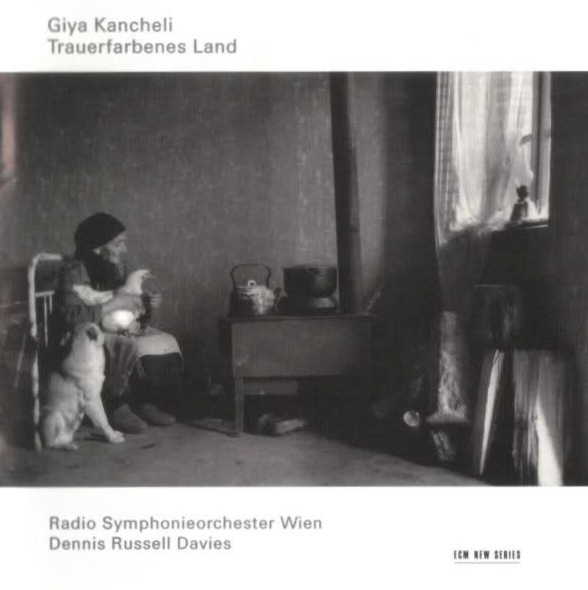 Kancheli shows a liking for more pronounced contrast in these larger settings, forging in that intersection a rather terse melodic territory that is constantly folding in upon itself like a cell dividing in reverse. It is also his unity. Like “left” and “right,” though divided into “evil” and “good,” respectively, we are reminded here that they both belong to the same body, and therefore can never be separated. ECM set a new standard of classical recording with this album, capturing the music’s quietest whispers and resounding roars with equal presence and clarity.